My MagicJack Plus, running on my aging HP T5710 with 512/512 memory, starting generating "low virtual memory" messages a few days ago, and then suddenly refused to load while claiming that the MJ server was down. 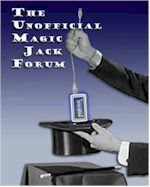 Yet, when I moved the MagicJack Plus over to my desktop XP SP3 machine, it loaded and worked just fine. I became a very light user of MJ some years ago once I learned of the weird restrictions the company placed on its use (conference call blocking, ever changing call length limits for outgoing calls, sudden account shutdown when outgoing call volume goes way up during a natural disaster while checking on dear relatives' well-being, etc.) Still, the MJ+ is handy in some cases where my former landline (now voip) number goes down, or I want to run ads that don't disclose my home address, etc. Given that light usage, does it make better sense to just wipe and reinstall XPe, or is the memory upgrade strategy in that gnbi.com link above still a viable strategy, or has it long been obsoleted by better parts, better ideas, or a more capable HP kiosk PC, eg., or some better strategy I'm totally unaware of? Thanks for your longtime and reliable resource on this platform that I'm sure has saved many a MJ users. I know this is several months old, but will chime in anyway. Can't comment on the feasibility of upgrade discussed at that link, but the guy seems to be talking about upgrading the flash module (which he calls memory for some reason). That may well be a useful upgrade generally, but your error message may more likely be a result of insufficient RAM. You could also try disabling the FBWF or EWF for a short time to allow MJ to update its software. That has proved to be periodically necessary in my experience. Thin client prices have dropped like a rock in recent years. I've been using a Wyse C90LEW for MJ for years, running their XPe version, but am switching over today to a D90D7 running WES7. For well under $50 you could upgrade to a massively better thin client.